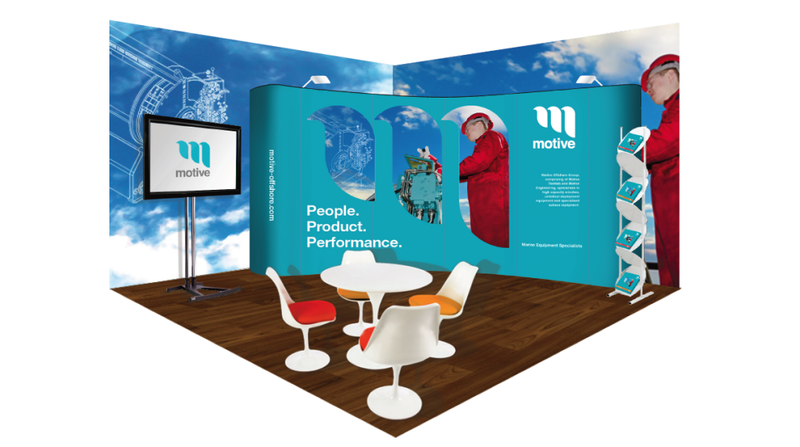 The recent Subsea Expo 2015 in Aberdeen saw the relaunch of Motive Offshore Group with new brand identity development and branded exhibition stand by Design Incorporated. The results of a busy 3 months’ work including: strategic consultancy, design, imagery and tone of voice was delivered on schedule and on budget at the key subsea show. Motive Offshore committed to making a bigger splash with their experiential investment and the resulting branded exhibition stand design shows off the new brand assets very nicely. The branding brief and subsequent design work included development of a device to complement the logotype – the coiled cable graphic was the creative option favoured and features across the stationery and literature templates as both a line work version and a window for brand imagery. The colour palette was developed around an optimised shade of light blue and is inspired by the hi-vis safety equipment colours used in & around the offshore and subsea industries. We are currently working on the signage, way finding, apparel and vehicle liveries and look forward to taking the brand to the digital domain in due course. To talk to one of our consultants about our approach to branding and branded exhibition stand projects please click here. To view our branded exhibition stands portfolio please click here.